My family really enjoys having fun together and one of our long standing traditions is Family Game Night. 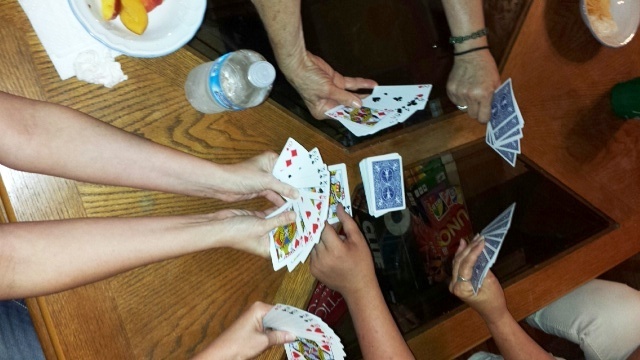 Members of the family that are able to, gather to play board or card games, laugh, visit and of course, share food and drinks together. Tonight, for my first, I learned a new game called Mau. Only my grandson, Dayan, was familiar with this card game, played with one or two decks of standard cards, depending on the number of players. Also gathered together for this game night was my sister Linda, who hosted the festivities at her house, my mom, daughters Adriel and Elissa, and of course, me. Greg joined us for pizza and snacks before heading out after a long hot day of work. Mau was an intriguing and interesting game. The aim of the game is to get rid of all the cards in your hand, without breaking the unspoken rules. Yes, that’s right. There are rules to the game and no one knows what they are, except the chairman of the game, in this case, Dayan. The specifics of the game are learned through trial and error, mostly error. A player who breaks a rule is penalized by receiving an additional card or cards. The person giving the penalty must state the rule that was broken, without explaining the rule. It sounds difficult, and it is definitely challenging, but it is a game of observation, deduction and memory. By observing the card played and the penalty given, the rules can begin to be sorted out. We had a lot of fun. And in spite of being accused of making the game up as he went along, Dayan was not. There is a very specific set of rules, with the main rule being, don’t reveal the rules! 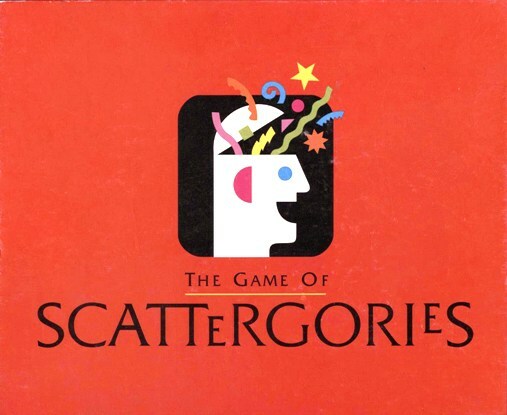 After a couple of rounds of Mau, we settled into a family favorite, Scattergories. This game is the most fun played with a group of four or more. Each player fills out a category list with answers that all begin with the same letter. The letter is determined by the roll of a dice with the alphabet on it. As soon as the dice is rolled and the letter selected, a timer is set and the list making begins. As an example, the letter may be an “M” and categories may be: girl’s name, an item with spots, sport, park, farm animal, kitchen item or something in a suitcase. There are 12 such categories per card. After the timer signals the end of that round, the answers are read off and if two or more people selected the same word for their category, those words are eliminated and not scored. Each unique answer scores a point. The game can continue for up to 16 rounds. At the end of the game, the person with the most points win. It was during Scattergories that the hilarity began. Some of us get creative with our answers, after years of playing this game together. And sometimes, we amuse ourselves. I got so tickled over one of my own answers, I laughed and laughed before I ever got to read my word, or in this case, phrase. I got the point. We have a good time, and laughter is such a great way to de-stress and open up. The last game we played was one Adriel introduced us to, called Set. It is a card game of visual perception. The goal is to be the first to see a set from the 12 cards face up on the table. A set is three cards that are either all the same or all different in each individual feature. Set is fast paced, challenging and fun. Each of us leaned in to scrutinize the cards before us. 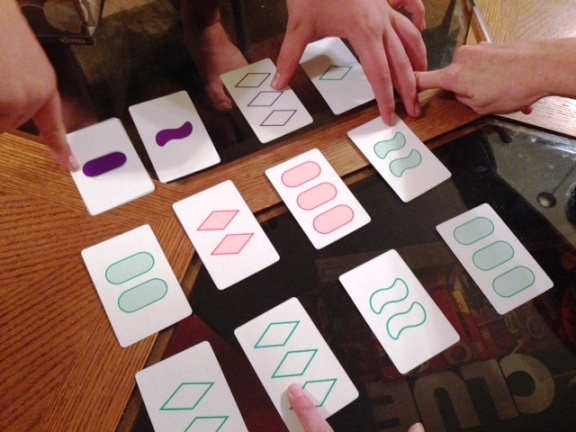 If we saw a set, we called out “Set” and then touched the three cards to show what we saw. Adriel is very good at this game, often calling out “Set” before the rest of us have even looked over the cards. Elissa and Dayan both caught on quickly and I was beginning to get the hang of the game. Linda came up with a strategy….send Adriel a text to distract her so the rest of us could scan the cards! The person with the most sets at the end of the game, wins. Adriel was the champ several times and Elissa won the last round. I love that my family still enjoys gathering for a night of food, chatting and playing games. I hope next time my son and his family, Elissa’s fiancé Josh and his son, and my nephew Eric and his family can join us. The more the merrier, we say. Laughter does the heart good. Our hearts should be in great shape!